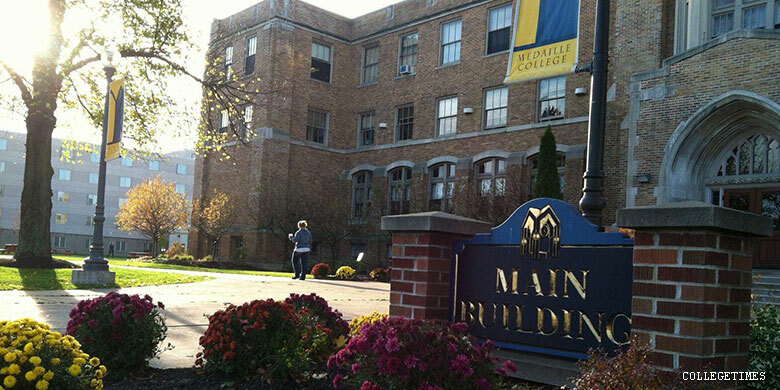 Medaille College : Buffalo is a Non-Profit, Liberal Arts, College established in 1937. The campus is located in Buffalo, New York, USA and hosts students with an endowment of $8 Million (2012). I signed up for the online Clinical Mental Health Counseling program. Rating the academic quality 1 star is too generous. Each course has the same exact weekly assignments. There is no deviation, even though the course material is completely different. Nearly all of the assignments are useless. The most ridiculous was the class “project” in MH630 Psychopathy – we had to RETYPE THE DSM 5. Not analyze it, not write a case study, not any kind of critical thinking assignment – we literally had to COPY the DSM 5 into charts listing the symptoms, diagnostic criteria, risk factors, and differential diagnosis for each disorder.Even though I basically only needed these classes to rubber stamp my LPC application, it was still an extremely disappointing experience – I enjoyed grad school & would have loved to further my clinical knowledge. Medaille is nothing more than a very expensive diploma mill. DO NOT complete a full degree here – you will learn nothing and waste a whole lot of money. I would strongly advise AGAINST anyone attending Medaille. It is hard to think of anything good about the school or what it does well enough to justify the hefty price tag and costs. ACADEMICS – One program is known for being truly challenging (Vet Tech), the rest are total jokes, anyone with a pulse will pass them. Professors do not challenge well or if they do completely overload the students with busywork. Nothing is done to move out incompetent teachers. School mostly relies on adjuncts, can’t remember the last time they hired a full-time professor. FOOD – Not the stuff you would give to a homeless person. The meals here are undercooked and expensive. Make no mistake, if you eat at the Chartwell’s Dining Hall, you WILL get sick. It has happened to everyone who has eaten here. This isn’t an exaggeration or urban legend, it is the truth. STUDENT LIFE – The clubs here offer nothing or are completely corrupt once you get in. There are no activities going on that are ever worth your while. Weekends are dead because everyone was smart enough to go home. This is a suitcase school at its finest. STUDENTS THEMSELVES – Admissions does a great job at selling the place as a cutesy little home for four years, but the truth is that the transfer/dropout rage is one of the worst for four-year-schools in the area, and the people that remain are miserable. The only people here with any sort of social skills are the stuck-up private-school soccer/basketball players and their groupies. These are some of the most hateful, gossip-fueled people you will ever meet. It’s downright mindboggling how some of these people were even able to graduate from high school. CAMPUS – Actually the campus is pretty decent. The grass is cut and maintained pretty often, and there’s some attractive benches and tables to sit at on a beautiful spring day. That said, it’s physically very small, so you’ll feel boxed in you stick around here for too long. ATHLETICS – Like I mentioned, the jocks here run the school, and good luck breaking into their fan club if you’re not a hot freshman with no qualms about getting felt up 24/7. Is it worth it though? The gym is small and cramped, games are pretty bad to go too, and this is a D-3 School, meaning that if any of the teams are lucky enough to make the playoffs, they’ll quickly be eliminated by a better team. It doesn’t matter though, they won the title in the worst division in NCAA! DORMING – Don’t do it. It is bad here. The RA’s are really bad at their jobs, and their bosses don’t seem to care. They will charge you for every little thing during room inspection, even if it wasn’t something you did (i.e. peeling paint.) There’s always roommate drama and the freshmen are notoriously obnoxious every year. As annoying and pretentious as the commuter students can be, you can’t help but envy them sometimes because they don’t have to put up with the dorms. Shame on Medaille College for not protecting our students!!! If you plan on getting a quick degree than this is the college, however…the Rochester/Amherst campus DOES NOT do back ground checks on any of their hired staff, Instructors in peticular.It is known that an Instructor names Samuel Reele (Arrest Record is public knowledge at:http://niagara-gazette.com/local/x681276747/BLOTTER-Police-reports-published-June-2) was hired to intruct an accelerated program through Medaille had a violent history with youn adults. Reele had no experiance with teaching with the exception af sitting in on a class only 7 times. He is very unorganized and invites argumentation frtequently with his students. His performance as an instructor are not only off the wall \”odd\” it is very debateable whether or not he is teaching the correct methods. He often makes errors in teaching and places blame on the college or the text. ie…he is right, the text is wrong. BEWARE when applying at this college.He has deplayed tempermental and agressive behavior toward students and often \”FAILS\” then if he does not like the student. Get your moneys worth else where. If you plab on going to this school there is only a 40% graduation rate and they are only interested in your money…not you. BEWARE!!! ARREST: A Rochester man was arrested after an incident at a Grand Avenue home. Samuel Reele, 55, 382 Sannita Drive, was charged with second-degree criminal trespass and fourth-degree criminal mischief. A 29-year-old woman told police that Reele came to her apartment in the 2400 block of Grand Avenue at 2:25 p.m. Friday, and pounded on the door so hard, he broke it. The woman said Reele also tried to force his way into the apartment.